I posted a while ago that I couldn’t get on with my Granny Stripe Blanket as the yarn was out of stock at Wool Warehouse! – See my post on Computer Says No. Not anymore – yayyyyy. It has now arrived and we are back in business. My plan was to use the pattern from the fab Lucy at Attic24 but with a few changes to make it my own. So I decided that I would choose 7 colours in total and then repeat them across the rows. 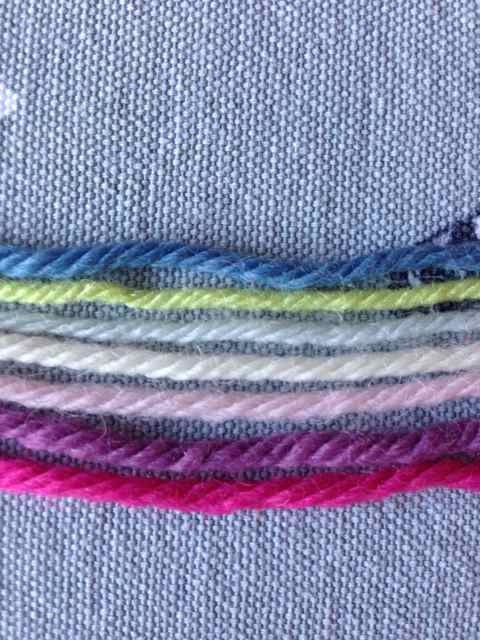 All the yarns are Drops Lima and from bottom to top we have Cerise, Heather, Powder Pink, Off White, Ice Blue, Pistachio and Grey Blue. I’ve started by doing a row of sc (single crochet) after the foundation chain and then two rows in each colour of granny clusters, leaving a space of two stitches between clusters to make a space – make sure that your foundation chain is divisible by three otherwise it won’t work! So each row starts off with ch3 into first space then one dc into same space, then 3dc into next space and so on until you get to the other end, where you finish with 2dc into last space before you turn and come back the other way by ch3 then 3dc into next space, back to the beginning when you finish by 1dc into the 3rd chain from the previous round. If this makes no sense at all then follow Lucy’s pattern on the link above. 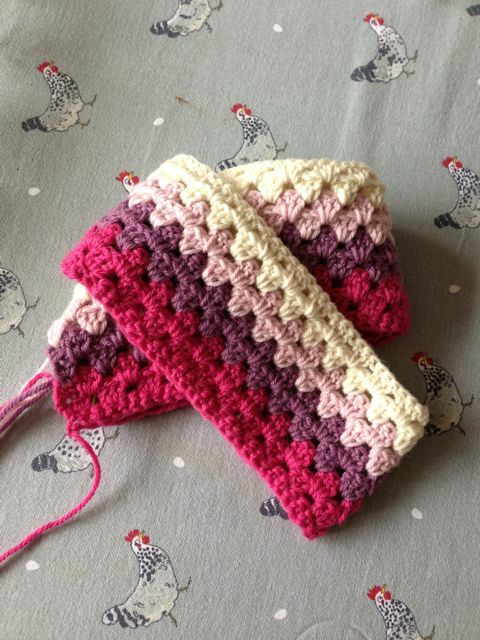 After my first fourteen rows (two of each colour) I have decided to mix things up a bit and do two rows of hdc (half double crochet in US terms – yarn over, hook through loop, yarn over again, pull through hook (three loops on hook), yarn over and pull through all three loops). 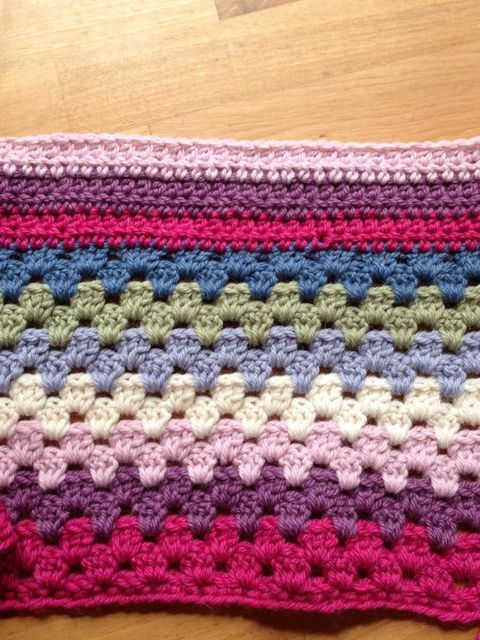 I am doing two rows of each colour and then going back to the granny clusters as I think this might break it up a bit and add a bit of interest. So there we are so far – I’ll let you know how I get on. Happy hooking. 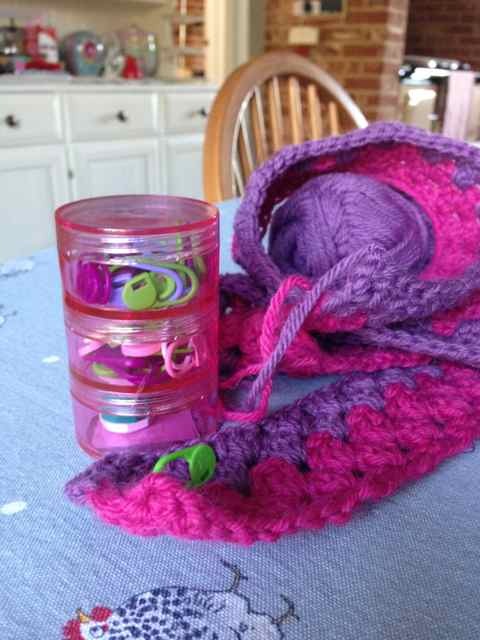 The Yarn Fairy’s Been Again! Lovely shades. I'm looking forward to seeing this as it progresses.